Not as good as the first one, this film is dark, but interesting, and the action and villains definitely make it entertaining. This movie is underwhelming considering how much was involved. Not only do you have the greatest team of heroes, featuring the best incarnation of the Hulk ever put on screen, but there is also what appears to be a cool and scary villain, in the ways of Ultron. Well, the truth is the villain is the first thing that doesn’t work. Ultron isn’t terrible, but he’s not as menacing as he should have been. In the original Avengers, Loki got us scared by turning some of our heroes into black bulging eyed zombie slaves. Here, the best Ultron can do is destroy the computer butler Jarvis, who never even had a physical form. The movie altogether omits giving us any scenes about bringing the crew back togther and recruiting them, which was one of the elements that made the first film so great. It takes a while for things to get going, but somewhere in the second half this film definitely picks up some steam. The addition of the Vision, the coolest character in the movie, really contributes to a newfound energy that suddenly arises after we are a ways into the film and looking for something more. With the Vision, we do finally get it. The Avengers: Age of Ultron is an okay movie. it’s entertaining at times, but far from anything special, and in fact, there are quite a number of flaws. What makes the movie worthwhile are the things that this sort of movie always has going for it automatically. The characters and their banter. From Iron Man to Thor, these guys are always fun, especially when they get together and have it out. The movie doesn’t short change us on the humor and light-hearted interactions between the characters, and so naturally the conversations between them are enjoyable. But then there’s the way the action and story are handled. The movie opens with an extended action sequence outside of a snow-covered enemy base. This is meant to be like a James Bond opening, starting off right away with action, but rushing it in this manner actually does more harm than good. The point of the scene is to get things started right away, throwing all of our characters into the action. Unfortunately, there are many problems that result. For starters, last time we saw Iron Man, in Iron Man 3, Tony Stark had destroyed all of his Iron Man suits and vowed to give up that lifestyle. Despite this, the movie opens with him in one of those suits fighting. No explanation given. Another problem with beginning this way… part of the fun of these movies is seeing the cause that is so big each of these heroes is called in to come together. Seeing how they are all contacted and brought back by Nick Fury (Samuel L. Jackson). especially the Hulk, who is unstable and only called for emergencies. This movie omits all of that and goes straight for the action. Normally, the strategy of not wasting any time would be a good thing, but in The Avengers: Age of Ultron, it feels more lazy than strategic. It seems like the movie is skipping right over what could have been some really great moments. There might have been scenes before this that were cut in the interest of saving time, but most likely they were going for a Bond action opening and that’s exactly what they got. Unfortunately the action here is very CGI and quite obvious about it. Good computer effects are the kinds you barely even notice. This movie doesn’t have them. On top of that we get the lousy joke where Captain America saying “language,” in response to someone cursing, and how the other characters just won’t let it go. Talk about beating a dead horse. Similarly, at a party scene that comes shortly after this, Rhodey (Don Cheadle,) better known as War Machine, keeps repeating the same joke. We hear it three times, and it’s not even funny the first time. I suppose we are meant to laugh at the patheticness of this guy, desperate to amuse with his joke, but it doesn’t work. While some of the humor falls flat, the storyline is ok, and keeps us interested. Early on, The Scarlet Witch (Elizabeth Olsen,) puts a hallucination spell on Tony, and suddenly the alien worm-snake creature from the first movie, which is hanging on the ceiling of the snow fortress here, comes to life. This is where the movie starts getting kind of cool. We leave the fortress and go to Stark’s Avengers hideout in New York where he and Bruce Banner (the Hulk in human form, played by Mark Ruffalo) are desiging a new robot computer program. It’s called Ultron and they show it’s brain or mainframe right next to that of Jarvis (Stark’s computerized butler) in order to compare. This is all kind of neat. So is the party scene that follows it where some familiar characters to the Marvel universe show up. The movie even gives explanations for the characters who are not there (mainly Thor’s Jane and Stark’s Pepper Potts.) The party scene is a lot of fun and includes great banter about Thor’s hammer and how nobody else can lift it. I like that the film addresses this Sword in the Stone element, which is more magic than practical. It’s like calling out it’s own flaws so that we don’t have to. The party ends, and Ultron shows up. 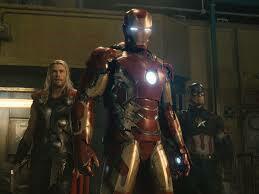 He’s got Iron Man’s Iron Legion security robots under his control and they attack the heroes at the party. Those robots get defeated, but not before Ultron gets away. He claims that he killed someone, and then he takes off. The heroes quickly realize that he’s referring to Jarvis. Now they start concentrating on how Ultron was created and what files he was looking at before he left. That leads them to an African city called Waconda, which is the home of vibranium, the most powerful metal on earth (since the X-Men movies have claim to the word adimantium, the Marvel films have to make up a different kind of metal. it’s incredibly stupid that they can’t share words.) The guys go to see a thief and underground dealer named Claw (Andy Serkis) in Waconda, only Ultron and his two new associates, Scarlet Witch and Quicksilver, get there first. There’s a cool moment where Ultron pokes fun at the usual superhero cliche of a villain taking the time to explain his evil plan, but otherwise, there’s not a whole lot going on here. The whole Africa sequence only exists to give us a big Hulk fight scene where we can get Iron Man in Hulk-Buster gear fighting it out with our favorite green giant. Before this happens, when the Avengers show up in Africa, Scarlet Witch puts halucinogenic spells on all of them. All except for Iron Man (who learned from the one she did to him earlier in the film,) and Hawkeye (who has a funny comment about how he was under a spell in the previous movie, and is not a big fan.) the Hulk ends up going nuts, which leads to Tony bringing out the big guns. It’s a machine called the Veronica (a joke about the Hulk’s former love, Betty), that is incredibly cool. This thing is like a giant satelite, hovering in the sky, supplying Tony with the right kind of armor at the right moment. First it shoots down the metal components that form a cage around the Hulk. Then it transforms Iron Man into the Hulkbbuster. very cool. After the massive Hulkbuster action scene, which includes the funniest moment in the movie (“Go to sleep, go to sleep, go to sleep,”) The Avengers are branded public enemy number one. They retire to Hawkeye’s farm where they get some downtime. Thor leaves them to go on his own spiritual journey. Hulk and The Black Widow find romance, which feels incredibly forced. And Captain America and Iron Man have a conversation while chopping logs that is meant to lead towards the next marvel movie, Captain America: Civil War. My biggest problem with all of this is the Black Widow – Hulk stuff. She seems incredibly desperate and totally out of character from what we’ve seen of her in other movies. This storyline was totally unecessary and should have been cut. At least make him seem interested. The final portions of the movie involve Ultron’s plan. He has the idea to build another robot who is capable of even greater things than him. The Avengers show up at the lab where he’s building this thing, in Korea, and steal it. Then they bring it to life themselves. The best part about this is all of the moral conundrums they face with heroic characters on both sides of the debate over whether or not to give this thing life. When they finally do, he becomes the Vision, and turns out to be a pretty cool character. The Vision looks and sounds fantastic. He even has a great moment where he develops his cape, to look like Thor’s. The climax of the movie involves the fictional city where the twins (Scarlet Witch and Quicksilver) are supposed to be from. 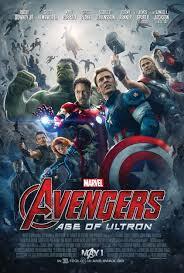 It’s meant to be a massive battle between Ultron and his army of robots, against the Avengers. Only it doesn’t really feel that way. Maybe it’s the limited use of scenery, unlike the first Avengers, which had it’s climactic battle on and around the skyscrapers and streets of Manhattan. For whatever reason, most of the action here in Age of Ultron is less than impressive. The same can be said of Ultron himself as a villain. Sure, James Spader doing the voice is fantastic, but Ultron just isn’t as scary or menacing as one might have expected. Maybe he should have killed a character earlier on in the film to help establish him as evil. That would have really added to the scariness and threat of him as a villain. Another problem is the question about whether or not Ultron can just move his consciousness into another computer or robot whenever he wants. This isn’t made as clear as it should have be. Still, between the Hulkbuster and Veronica, the Scarlet Witch’s hallucinogenic spells, and the Vision, this movie is loaded up with cool moments and incredible ideas.